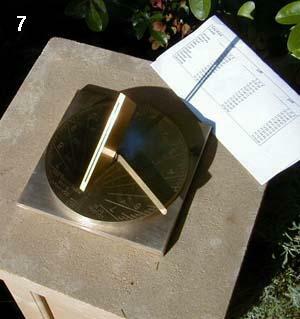 Before setting up your Spot On Sundial, please read these pages on "finding the time of local noon" and "finding your latitude and longitude", as they will help you to set up your sundial accurately. Place the two lugs on the tightening tool into the holes on the centre screw, and rotate anti-clockwise. 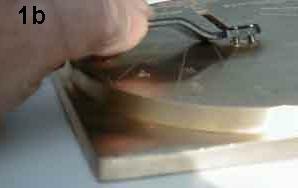 As the screw loosens, remove it completely, and separate the Circular Dial Plate (B) from the Square Base Plate (A). 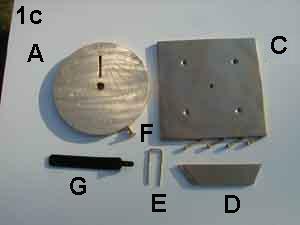 You now have the 6 components of the sundial and the 4 tightening screws as shown (1c). 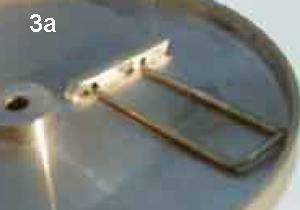 If you have Model E (San Francisco) , F (Los Angeles), or G (New Orleans) you should place the centre screw back in the hole in the centre of the dial plate, and secure it with a piece of tape before proceeding to step 2. You need to do this because the low angle of thegnomon on these models will not permit you to insert the centre screw with the gnomon in place as described in step 6. 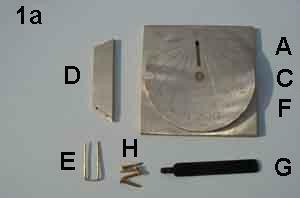 Hold the gnomon as shown and slide the thin end with the two holes into the dial plate, so that it is slanting towards the centre. The gnomon is a tight fit in the dial plate, in order to ensure it is at the correct angle. It is best to start with the acute angle, and then "rock" the inner angle into position. Turn the sundial over. The two holes in the gnomon should both be clear of the base plate. Position the gnomon retaining clipso that the "arms" are flat on the base plate, and the "hoop" is raised off the base plate (3a). Then slide the clip through the two holes in the base of the gnomon. 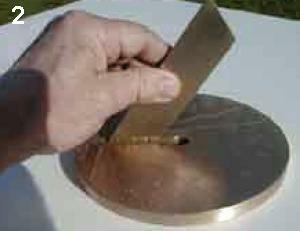 Set up the plinth on which the sundial will rest. Ensure that it is completely level in 2 directions at right angles to each other. 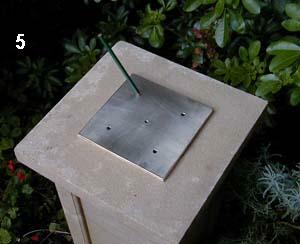 Place the base plate in the desired position on the plinth, and mark the position of the screws on the plinth using a pencil through the screw holes on the base plate. 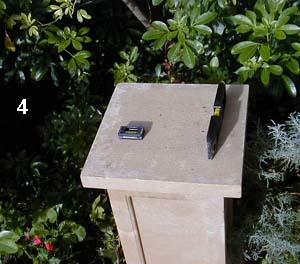 If you are certain that your plinth is level to within ½°and you want to compensate for the small difference between the latitude stamped on the dial and your actual latitude, so that you get the maxim mum possible accuracy from your Spot-On Sundial. 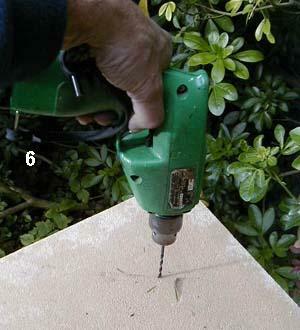 Drill out the screw holes in the plinth. Screw the base plate down onto the plinth with the 4 screws. Place the dial plate on top of the base plate, and line it up so that the centre screw will pass through the dial plate and locate in its correct position in the base plate. Insert the centre screwand tighten it by hand, leaving the dial plate free to rotate. 1. Set your watch accurately by a radio time signal. 2. Find out the time of solar noon at your location using our unique Solar Noon Calculator. 3. When your watch reaches the exact time of Solar Noon, rotate the dial plate until the shaft of sunlight shining through the slit in the gnomon lies exactly along the dotted noon line. Then tighten up the centre screw further with the aid of the tightening tool. Your sundial is now set. If you require more exact setup please see the advanced setup instructions.